We won two gold and one silver medal at the prestigious Free From Food Awards on May 10th, 2018. 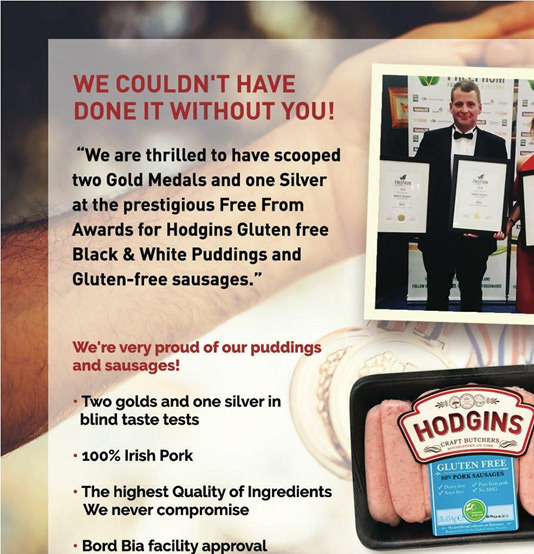 The medals were awarded for Hodgins Gluten-Free Black and White Pudding and our Hodgins Gluten-Free Sausages. The winners were selected by a panel of experts who carried out a blind tasting using the criteria of appearance, aroma, texture and taste. Co-ordinator on the night Emma Clarke Conway commended Hodgins on winning awards for all of their gluten-free products, saying that “there is a huge difference between gluten-free and taste-free. It is always heartening when you taste a product that is gluten-free, but still packs a punch on taste. It means that everybody in the family can eat the gluten-free products without any taste penalty.” Hodgins is a great example of this. The Hodgins range can be found in Tesco, SuperValu, Dunnes Stores , Iceland and independent stores across Ireland.